Indians are pioneers in trans-continental marriages. Long before outsourcing became a buzzword, Indian immigrants were the granddaddies of outsourcing – of spouses, of all things! Not surprising, in a culture where matrimony is the be all and the end all of life. Whether you’re shy or outgoing, rich or poor, educated or not, gay or heterosexual – marry you must! It’s the Indian thing, the desi thing, and the patriotic thing to do. Years ago, when the Diaspora was young and evolving, it was largely single Indian males who were venturing out into the world to seek their fortune. The wave of largely single male students and professionals who came to America in the 60’s usually headed back to India for an authentic homegrown spouse. Over the years that tradition continues to thrive. Now we may be in the 21st century and this may be America, but more than a few second-generationers – born and brought up in the U.S. – are still outsourcing their spouses from India. The children of the Diaspora have come of age and now eligible girls and boys are as likely to be in India as in the United States, Dubai or the United Kingdom. Their back office can be anywhere from Bangalore to Mumbai to Punjab – wherever concerned grandparents, uncles and aunts and nosy neighbors exist. In the past, as even now, most of such cross-country weddings took place by word of mouth. Indian relatives are a hardworking lot who take duty and relationships very seriously and for them finding a suitable spouse for a niece or a nephew or even a cousin far removed is a badge of honor. A girl has just to reach the magic age of 18 and the matchmaking begins in earnest, with suggestions of a suitable boy in Chennai or Chicago. In India everyone’s a matchmaker at heart and there’s always the cousin of a cousin or the friend of a friend who knows the perfect boy. Besides the home office, there are the professionals, matchmakers in every community whose sole business is to find appropriate spouses for returning NRIs. Even the national media are involved, with reputable newspapers devoting pages and pages to matrimonial ads, assisting cross-country couples to get hitched. In India’s marriage-crazed culture, everyone’s a matchmaker. 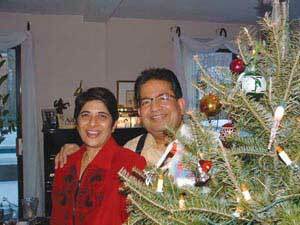 The love story of Sonal and Ajay Israni, who are both physicians in Philadelphia, could easily be subtitled “The Tale of Two Aunts.” Sonal lived in Bombay and Ajay in the United States and the two might never have met had it not been for the persistence of these relatives. “My dad’s sister and Ajay’s dad’s sister are friends, and for six years they were trying to get us together and neither of us was interested in meeting the other,” recalls Sonal who came from Bombay for her residency in Grand Rapids, Michigan. 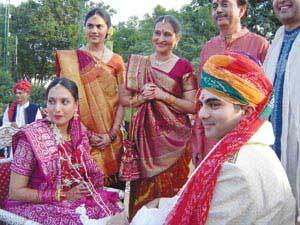 Sonal and Ajay Israni were brought together by two persistent aunts. Finally pushed, the two emailed each other and then spoke on the phone. Sonal was working in Atlanta at the time and Ajay came down to meet her. Another couple who met the old-fashioned way and have been married for nine happy years are Rajiv Jain, born and brought up in New Jersey, and his wife Jyoti, who has spent her whole life in Bombay. Once again it was an uncle who united the two. They met formally at Jyoti’s house over sweets and savories, and then got to know each other better on several more occasions. Today the couple lives in Old Bridge, NJ and has two sons Rahul and Rishabh. While this outsourcing of spouses is ably assisted by a cadre of relatives and matchmakers, now there’s a new matchmaker in town – the Internet! Yes, artificial intelligence is taking over jobs generally done by humans. Matrimony websites are taking giant leaps in getting couples connected, no matter where they live. Immigrant parents can take heart: they may have lost their village, but have gained a world full of same caste, same region prospects from London to Chennai to Atlanta! Indeed young – and sometimes, not so young – Indians from Hong Kong to Birmingham to Frankfurt are finding suitable spouses on the Net, without the intervention of family members. There are scores of dating and matrimony sites, such as Bharatmatrimony.com, shaadi.com, indianmatrimonials.com, mydesimatch.com, and snehaquestcom, which have assumed some of the traditional duties of parents and relatives. 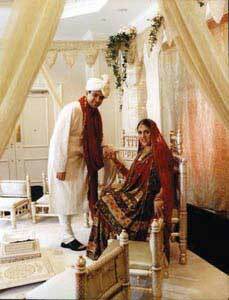 You can even find matrimonial websites targeting narrow subgroups, such as patidarmatrimonial.org, aimed at the Patel Patidar community, or falgunimehta.com, which targets the Gujarati, Marwari and Kutch communities. If you’re planning to visit India over the vacations, Falguni Mehta’s Marriage Bureau promises to have the widest prospects ready on your arrival! Bharatmatrimony boasts that almost 200,000 profiles on its system are from the United States, Middle East, U.K and other parts of the world. That trend did not escape another NRI, Anupam Mittal, who spent 10 years in the United States. He recalls that while in India he had a brief encounter with a “marriage broker,” somebody who carried bio-datas in his bag and hopped around from house to house, trying to facilitate a match and get a commission if it materialized. “This got me thinking – how many bio-datas can this man carry in his suitcase and how many people can he visit in one month?” asks Mittal. This was Mittal’s “Eureka” moment and he decided to use the Internet to connect couples around the world. The result was Shaadi.com. Mittal says while 65 percent of the registrants are from India, 35 percent are NRIs, the majority from the United States. Divya Ravindran, a physician in California, had posted her profile on the site and they really hit it off. They emailed each other and exchanged views and chatted for some time. Then followed the long phone calls and as things began to jell, they told their parents. “It turns out we were from the same caste and all those things that make everybody else happy!” says Divya. Divya and her father stayed with Aneja’s family then all of them went to Divya’s family home in Karnataka where they were engaged. Within three months they were married and now Aneja is in Los Angeles too, working with an Internet based security company. The electronic matchmaker also worked for Hemant and Leena Kandalgaonkar, both previously divorced and living on different continents. “We met on the first of December and by Jan 9 we had decided to get married,” recalls Leena, who was living in Bombay as an independent woman with a good job, a car and an apartment of her own. Having just seen each other’s pictures, they decided to get married even before they physically met. This cross-country romancing is happening with the second generation too. It is facilitated in part by instant messaging and email, which seem to magically erase geographical boundaries and make everything immediate and easy. The changes for the relocating spouse can be daunting. 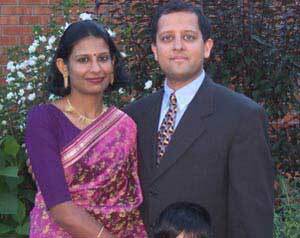 Recalls Sonal who married Ajay Israni, the physician in Philadelphia. “When I first came, I didn’t know how to drive a car, I didn’t have a social security number, I didn’t have anything. Most Indian girls stay at home with their parents and they’ve never lived independently so it’s hard for them to have to manage their own households. It’s been a real learning curve, learning to change light bulbs or check the fluid level in the car. But the hardest thing, she says, is having one’s parents and siblings so far away. The couple is now moving to Minneapolis where they have both accepted faculty positions with the University of Minneapolis. The outsource-a-spouse tale is one of surprises, hilarious incidents – and sometimes, dashed expectations. That’s inevitable when people brought up with different worldviews decide to become bedfellows. They can have dreams together – or nightmares! For Jyoti, coming from the warmth of Bombay, the hardest adjustment has been New Jersey’s cold weather. She had never ever worn a sweater and now even in May she is discovering herself bundling up in sweater and socks. So does outsourcing your life partner make for happiness? Is an imported spouse better than a homegrown one? It’s all about expectations and realities and overcoming the perception rampant among many parents and some prospective grooms that a homegrown spouse is more traditional while an Indian woman raised in America is too “American” – read bold, independent and outspoken. Just as outsourcing raises the ire of workers here, some Indian American women see red too when they complain of Indian-American men who are happy to date them, but then go back to India when it comes time for commitment and marriage. Often times, they are pressured by parents who push their mythology of a traditional Indian daughter-in-law. According to Dr. Sangeeta Gupta of Los Angeles, who did her dissertation on the retention of ethnicity in the Indian American community and is currently doing research on Indian American women and their relationships with their in-laws, women who grow up here often feel misrepresented. She feels that the yearning for settling down in the U.S. has decreased amongst Indians over the last 3-4 years, and one of the reasons is the fast growing Indian economy and good job prospects there. In fact, the real picture is itself quite gory (see sidebar). A major impetus for outsourced marriages, according to Sharmila Rudrappa, assistant professor in the Department of Sociology and Center for Asian American Studies at the University of Texas at Austin, are Indian IT workers, many of whom came here in the 1990s. And so as Bombay, London, New York and Dubai become ever closer, through email and air travel, couples in the Diaspora are finding each other in the most unexpected places. Sometimes these marriages fail and sometimes they work very well. It’s all about expectations and adjustments. Indeed, it has to be karmic or cosmic – otherwise why would a goddess-like Bollywood star leave the glitz and glamour to become an NRI wife in California? The hugely popular actress Madhuri Dixit is married to Los Angeles physician Dr. Sriram Nene and lives part of the year in California. Padmini, the noted dancer and heroine of Raj Kapoor movies, who left the film industry to marry a physician in New Jersey, started the trend many moons ago. The most recent is Pooja Batra, who has moved to the U.S. to live with her NRI husband. Movie magazines are full of stories about her having signed up with the Wilhelmina Modeling agency. As India becomes ever more cosmopolitan, its inhabitants are sometimes more westernized than Indian Americans. They know what’s hot and what’s new and follow international trends religiously. The jet set circles are the same and for the movers and shakers, New Delhi, New York, and London are all on the same radar – with fashion shows, overseas holidays and international shopping making it one big chic biradri. Many of them have been educated in London or in the Ivy Leagues in the U.S., and so they bump into each other in all the right places. Even the British royal family is getting into the outsourcing act! One hears that Lady Ella Gabriella, the 23-year-old daughter of Prince and Princess Michael of Kent is planning to marry her Indian boy friend, Aatish Taseer, and may well settle down in New Delhi. Now that’s some royal outsourcing!